Wing/Hackle: Llama hair with holographic enhancer, several colors of your choice. Layout board: 1- X 3-inch board about 18 inches long. About 5 inches from one end place two small finishing nails about a quarter of an inch apart on a line running across the board. About 10 inches down the board place another nail. Clamp the board to a table or have a friend hold it when you start spinning the dubbing loop. Spinning hook: Coat hanger wire or light brass rod about 7 inches long. Form a hook at one end. Wire: 0.006 Stainless steel - on a spool in a bobbin. The key to this durable pattern is building your own dubbing brush with 0.006 stainless steel wire. 1. Attach the wire to the spinning hook with a simple twist. Lay the hook on the layout board so the hook is trapped by the two nails. Pull out enough wire so the wire can be laid around the third nail and let the bobbin hang. Pre cut the llama hair to length - about an inch and a half or slightly longer. Cover the wire on the board with a light coating of cement and immediately spread out the patches of llama hair on the wire over the length between the nails. Lay on thin layer of Enhancer followed by another thin layer of llama hair. Use the same color pattern as on the first layer Pick up the bobbin and pull out enough wire to reach the spinning hook. Coat the wire with cement. Lay the wire on top of the llama hair and next to the hook. Keep tension on the wire. Carefully lift the hook from between the two nails and attach the wire to the hook with a simple twist. Cut the wire loose from the bobbin Keeping slight tension on the spinning hook, spin the hook in your fingers until you feel the wire loop start to shorten. Experience will be your best guide. Too much twisting will break the wire, not enough will not trap the hair securely. Before removing the dubbed loop from the third nail, brush the llama hair in both directions with a small-animal currycomb. Don't be afraid to use a heavy hand as you want to comb out any thick clumps next to the wire core. 2. Put a hook into a strong vise and attach the tying thread near eye of hook and line with thread. Stop above point of hook where dubbing brush will be secured. 3. Secure the dubbing brush with hair sloping away from the eye, and wind thread forward to near the eye. Cut off any excess wire at the tie down point. 4. Wrap the dubbing brush tightly with very close wraps onto the hook. Brush the fibers rearward as you wind forward. Picking out tied down fibers as you wrap will make the final brush out easier. Stop about one eye length back from eye. 5. Secure wire dubbing brush to hook. Trim excess dubbing brush, and wrap the end tightly. 6. Usually some llama hair sticks out over the eye. To eliminate, pull back all of the hair with fingers just behind the eye, and quickly pass a cigarette lighter under the eye. It burns off all the wild hair. 7. Form a neat head, whip finish and coat with cement. 8. Finally pick out any tied down hair with a bodkin or dubbing needle, and brush the fly vigorously with the currycomb. This same technique could be successfully applied to several popular steelhead patterns. For example, with the correct colors and judicious trimming of the llama hair brush after wrapping a very interesting and beautiful variation of the General Practitioner could be made. Also llama hair could replace marabou in many of the patterns mentioned in Trey Combs' book. The possibilities are almost endless. I planned to write about the Popsicle tied with marabou this month. However, the plans changed when I saw Jim Cramer tying his Llama Popsicle at the 2002 FFF Show in Livingston. He didn't invent it, but first saw this fly tied by Jay Murakoshi. 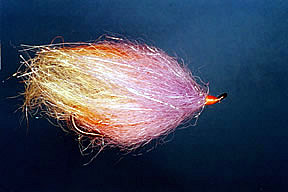 Llama hair has a nice feel to it, and many tiers claim that it has a good action to entice fish. There are not many flies where one of your tools needs to be wire cutters, but this is one. A couple of authors credit George Cook for designing the Popsicle in the early 1980s (1985 according to one). When asked what he was going to call it, he looked at the colors and said, "Popsicle." His pattern certainly is colorful with orange and red marabou and a purple schlappen hackle. Many other fly tiers like John Farrar with the Skagit Spey Series and Bob Aid were also developing successful marabou patterns for salmon and steelhead in the early 1980s. (See Steelhead Fly Fishing by Trey Combs, pg 418-425.) Quite a few steelhead anglers have adopted the Popsicle with numerous variations as their standard steelhead pattern. They should try the Llama Popsicle. In the early days of steelhead fishing, "you had to be on the bottom to catch them." Therefore, we used HiD or Super HiD full sink fly lines or shooting heads. We caught fish and also lost a few lines on the rocks. Then some radical anglers began using floating lines in early fall and resorted to sinking lines only in late winter. Pretty soon everybody was using floating lines most of the time and sink tips in cold water. Now many of the good steelheaders are using sink tips most of the time. Things change, but the one thing that hasn't changed much is the presentation. 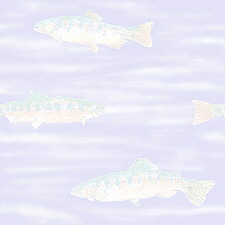 it is cast across or down-and-across with a wet fly swing. Mend the line so you have a straight line to the rod and reel. Of course we had to include this...since we have 2 llamas. Anyone need any llama fiber?? ?